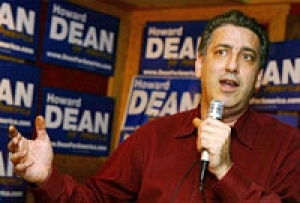 When Joe Trippi came on board as campaign manager for Howard Dean, the former Vermont governor was a relative unknown and a long shot for the nomination. By the time the Iowa Caucuses rolled around, Dean was the man to beat, having racked up a load of big-name endorsements and smashed a string of Democratic fundraising records. He owed the turnaround to Trippi, whose pioneering campaign strategy had harnessed the Internet to bring candidate and supporters together in a high-energy grass-roots movement like nothing before seen in American politics. In his new book, “The Revolution Will Not Be Televised,” Trippi traces the rise and fall of the Dean campaign, and tells how his fascination with technology converged with a group of 650,000 supporters ready to embrace it. Trippi, now a commentator on MSNBC — and an avid blogger — talked with MotherJones.com about the presidential race, the lessons of the Dean movement, and the Internet’s power to transform the way America conducts politics. MotherJones.com: In your book you talk about how some people innately understand the Internet, while others “just don’t get it.” When did you first “get” the Internet, and when did you realize it could be applied to campaigning? Joe Trippi: I used to read the THQ bulletin board – a company that makes games for Playstations and Xboxes and Game Boys. There was a guy I really liked to read, just a normal guy named David Haines, who was posting almost every day. After I’d check my e-mail and checked out the news sites, I’d go over there to look for a post from Haines and read it. He came on one day and said, “Sorry I haven’t posted in five days. My wife just gave birth to our baby son Christian.” Then he’d go back to reposting every day, and like five months later he posted “Christian started walking today.” By the end of two years, we all knew that he was an amateur tri-athlete who lost every race he ever entered, that he had a dog named Bruin, and that his wife gave birth to a baby daughter about 18 months later. About two years into visiting that bulletin board, I was reading it one day when this guy came on and said, “I have horrible news. David Haines died tragically of a massive heart attack this morning at the age of 31.” All of a sudden, I realized I was witnessing a funeral on the Internet. All these thousands of people who’d never met David Haines were eulogizing him, were talking about starting an education fund for his children. This community – built around a video game company of all things – was doing things that too many Americans don’t do for their next-door neighbor or a guy five blocks away from us. It dawned on me right then and there: if a group of people could create a community like that on their own, what would happen if you built that same kind of community around a candidate for the presidency of the United States? Or around strengthening our democracy by getting people to participate in the future of the country. That’d be a really cool thing. I’d sworn off working on any more presidential campaigns, but I also knew I was crazy enough that one day I might. So I made a note to myself that if I ever went out of my mind and did it again, I really wanted to see if that kind of community was possible. MJ.com: Why didn’t previous presidential campaigns use the Internet as effectively as you and your staff did with Dean? JT: The first thing was the Net hadn’t really matured enough. You had to have Apple, IBM, and the other computer companies get computers out to everybody’s homes. And you had to have ISPs like AOL, MSN, Earthlink, and others to get us to connect up. Then you had to have people like Amazon.com and Ebay come along and get enough Americans to trust that their credit card wasn’t going to get stolen and the book was actually going to show up two days later. As millions of Americans started to do that, the Net evolved to the next phase — empowerment. John McCain came along in 2000, and his campaign did a lot of very innovative things on the Net. He sort of became an Internet candidate, but he had only 40,000 people who ever signed up for him. But since then, that many more people have used something like Ebay or Amazon, or have formed their own communities. And I think I was lucky. I’d worked on six presidential campaigns – generally for one of the more progressive guys in the race – and at the same time had this fascination with the Internet and how communities were building on it. It was luck that I had those combined experiences and was lucky enough to get an opportunity from Howard Dean, who was willing to try it. If I’d gone to work for some of the other campaigns, walked in and said, “let’s try this new Internet stuff,” they probably would have thrown me out of the building. So it took a guy with courage like Howard Dean, who was standing up to the war, and realized we had to do something totally different to get on the ground, and was willing to let us all go do it. In the end, it wasn’t me – it was the 650,000 people out there who made it all possible. MJ.com: You talk early in the book about how much of the Internet strategy was developed by looking at things previous presidential candidates, like Gary Hart and Jerry Brown, had done before. How so? JT: Gary Hart had this whole new theory of organizing that he called “concentric circle organizing.” The way he’d describe it was if you drop a pebble in a pool of water and look at what ripples out, those are the waves of energy. He thought it was a mistake to run around and talk to crowds of 1,000 people. He thought it was smarter to go one-on-one, really talk to someone and connect with them. Then you leave that pebble in Iowa, and that person you leave is so energized that they go out and start organizing. I remember in 1984, when I worked for Mondale, watching this concentric circle theory of Hart’s and how we almost got creamed by it. Mondale had all this money, and this guy had all these pebbles that he would leave in towns. He almost took Mondale down, winning state after state. It also occurred to me that the Internet was Hart’s concentric circle organizing strategy on steroids. Eventually, 650,000 pebbles were dropping out of the Internet for Howard Dean. That’s why I think you saw so much energy and commitment out there. So I think Gary Hart definitely influenced the campaign, probably more than any other. When I worked for Jerry Brown, I was doing media consulting. I’d always been a field organizer out working with people, and I was making the transition to be a media consultant. It just drove me nuts that television was this one-way thing that preached to you or scared you or spoke to you, but never let you talk back to it. I had this sort of primitive notion of using an 800 number to let people actually connect. Brown used that and we wound up raising something like $8 million over the 800 number in small donations of $100 or less. Looking back now, I realize that part of the Brown campaign had a huge influence as well. MJ.com: What made Howard Dean the right candidate for you to try this Internet model, and how did you get him to go along with the idea? JT: When we started, Howard was sort of a technophobe; he’d barely just begun using e-mail. He didn’t know what a blog was. He went from “What’s a blog?” to coming into headquarters saying “I want to blog today.” And by the end of the campaign, he was asking, “Why doesn’t the White House have a blog? If I’m elected president, I’m going to have a blog.” So he evolved in his knowledge and understanding from a technophobe to someone who really understood the Net’s power. In the early days, obviously his position against the war attracted a lot of attention. It was a catalyst for a lot of people to search him out on the Net and find him and support him. I think that gave us our initial group of people who used the Internet to find us. This was early, when we only had six or seven people on staff, about $100,000 in the bank, and we were using the Internet any way we could because we couldn’t afford to do anything else. But they still found us, and that was enough of an early start. MJ.com: Once you launched this open-source style of interactive online campaigning, how did it compare to your expectations? JT: I was surprised. When I took the job, I figured I’d give it the old college try, I’d be up there for three months and then be going home — because there was no money and we didn’t have any support. I thought it would work, but I didn’t think it would get us into contention and frontrunner status. We were really a Little League team that everybody thought was supposed to go to Fenway Park, buy tickets in the nosebleed section, and watch the real pros on the field teach us how to play politics. Somehow, we got past security and got out on the field, and I think we taught the “pros” a lot more lessons than we learned from them. I think that’s the real story of the Dean campaign. The open-source stuff was amazing. I mean, 650,000 brains are a lot smarter than the 50 or so people in the corner offices in Burlington. They spotted stuff that we didn’t see, came up with ideas we wouldn’t have thought of, and made the campaign a lot stronger. Just like how open-source works in running software –- it’s the difference between Linux and Microsoft. MJ.com: As the online presence developed, what benefits and challenges did that present for the campaign? JT: When there were only 432 Internet supporters, you really could communicate with them personally; and they self-policed amazingly. If people tried to disrupt our web site, supporters would immediately put up a fundraising bat in honor of the person who was trying to disrupt the site and hurt the campaign. They let real discourse and debate happen on any issue, but if someone was rabidly attacking Dean for no reason or using foul language, they would start raising $10,000 and be able to tell the guy, “keep talking – every time you post, we’re going to contribute another $10,000 to Howard Dean.” They self-policed, and after a while, nobody got out of line. That was all spontaneous — people on the Net doing that on their own. As we grew to 650,000 people, the site was still an amazing self-policing thing. The problem was, once you get to 650,000, how do you communicate with them personally the way I, as the campaign manager, or Dean, as the candidate, had been communicating with 432? I used to answer every email personally, and suddenly I was getting 10,000 emails a day. That’s the thing I’d like to figure out for the future. It was the one big problem we had, because we’d built this thing on personal communication and connection. As we got big, it still worked, but we started to lose that connection. MJ.com: How do you think the success Dean had raising funds over the Internet will influence future campaigns? JT: I think we really did change the way politics will be funded in the future. You look at John Kerry having $182 million to Bush’s $214 million — Karl Rove never counted on that. When they ran against Gore, they opted out of public funding and raised $125 million. And they knew us goody-two-shoe Democrats and progressives would stay in the public-funding system and lock ourselves in to only being able to spend $45 million. So they knew Gore was going to be outspent 3-to-1. And look what happened; he got more votes anyway. This year, they went ahead and thought us goody-two-shoe folks were going to turn the cheek again and let them opt out. And this time, they were going to go for $200 million. Karl Rove’s plan was to outspend the nominee 4-to-1 or 5-to-1, because he knew we would do the “right thing” and stay within the public-funding system. But what he never counted on was that we could do the right thing by putting it out to a vote of our supporters, that 300,000 Americans would go on the Net and vote and tell Howard Dean the right thing is to opt out, to chase George Bush and be competitive with him, and to beat him. Four days after those people voted –- 87 percent to 13 percent for us to opt out -– John Kerry held a press conference to say if it’s good enough for Howard Dean, it’s good enough for me and my campaign, and we’re opting out too. And Rove never counted on that. That’s why today Kerry has $182 million -– it’s campaign finance reform happening right before your eyes. It’s the first election where Democrats will be competitive with Republicans dollar-for-dollar. It’s not because we’re held prisoner to corporate donations and wealthy donors; it’s because average Americans are participating again and making a difference. That’s the real legacy of the Dean campaign. MJ.com: What other lessons do you think John Kerry has taken from the Dean campaign? JT: The obvious evidence is his sending a million emails out to his online supporters, letting them know his vice-presidential pick before the press or the wealthy donors or the labor leaders knew. That’s the first time that’s ever happened, and it was clearly ripped out of the Dean playbook. Now I think they’re thinking about opting out for the general election, and if I were them I’d put it to a vote of their people. Let us decide. Don’t keep it a decision made up in headquarters, but let the million supporters of John Kerry decide whether they’re willing to fund the campaign. Throw this campaign in their hands, and I think the American people will catch them and carry them into the White House. Because if you do things that way, it won’t just be changing presidents. It will be changing a busted political system that isn’t working anymore. MJ.com: Kerry’s still using more of a top-down model than you did. How well is he using the Net, aside from as a fundraising tool? JT: This is still a work in progress in terms of how campaigns use the Internet. I think the Kerry campaign is actually doing a really impressive job given how far we came in 13 months. They’re getting it. They don’t yet get it the way we did, but they’re getting it. And like I said, I think the first step I saw that impressed me was them announcing to their million online supporters the vice-presidential pick before they told anyone else. That was them understanding it’s about the bottom. Could they get better at it? Yeah, and I think they will. But also, I think the grassroots is figuring out that it’s not the knight in shining armor riding into Washington on a white horse that matters, but the American people themselves. And if enough of us get engaged and decide to make a difference, this year we will. MJ.com: Why hasn’t the Bush campaign made better use of the Internet? JT: My fear has been for a while that the Dean campaign was like the Japanese at Pearl Harbor, that we woke up the sleeping giant of the Republican Party that didn’t seem to know the Internet existed; and that like direct mail, like radio, like cable, they’d start to throw zillions of dollars and resources at it. But the Republican Party is the supreme command-and-control party. They’re so disciplined about how they deliver their message. The orders always come from the very top and go down to the next level and down to the next. It’s a very top-down, almost military-like organization in terms of how they do that. And that’s anathema on the Internet. The Kerry campaign is light years ahead in their thinking compared to the Republican National Committee or the Bush campaign. The Bush blog is just press releases that you can’t even comment on. They don’t allow interaction; they don’t want anything to disrupt their message. They’re just not doing that part of it very well, and I’m not sure they’ll ever be able to because of the way they do command-and-control. MJ.com: There’s still a large chunk of the population that doesn’t have access to the Internet. How to get them more involved in the dialogue? JT: Closing the digital divide is a lot easier than people think. It just needs a lot of brainpower. There’s no reason why, for example, in the AME [African Methodist Episcopalian] church in the African-American community, why there couldn’t be five PCs in every one of those churches hooked up to the Internet so that kids and parents could have access, and the kids could actually get an understanding of how the Internet works and get involved. That’s probably as simple as getting a company like Dell and AOL, or Apple and AOL, to build a partnership with community centers or the churches and actually start making a difference there. There’s an altruistic reason for the companies to do it, and there’s also a business reason. The reason Apple’s been putting devices in schools forever is they know the first PC you work on is the one you’re likely to buy later on. So there’s a way to try to bridge the divide, and it’ll need corporate help. MJ.com: Looking at the election, what do you see as the keys to success for Kerry? JT: I think it’s us. I think this thing’s out of the hands of both Kerry and Bush. It’s really now up to us. What I hope is that 3-4 million Americans will connect using the Internet and offline tools like meetups to have the greatest grassroots campaign in November that any Democrat has ever had. And I’m not sure it’s going to come from within the campaign. We don’t have to wait for the campaigns anymore. We have the power to do this.